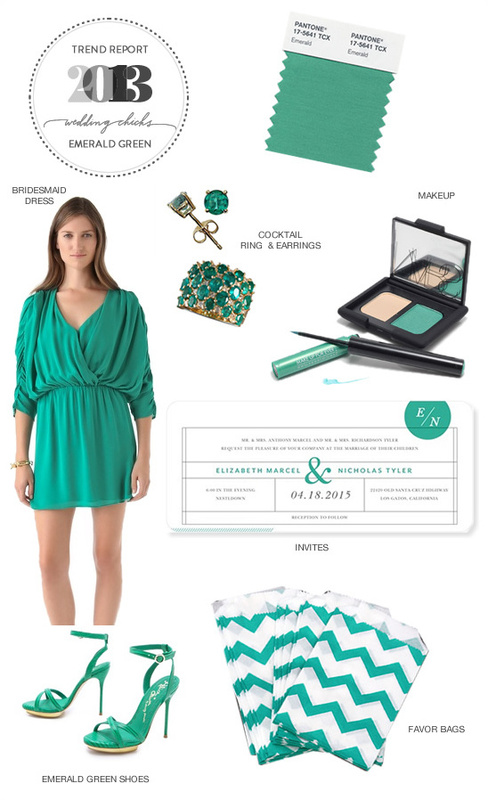 The 2013 Pantone Color of the Year is a color of elegance and beauty that enhances our sense of well-being, balance and harmony. It is PANTONE 17-5641 Emerald, a lively radiant and lush green. Here is a little round-up of a few of our favorite emerald green picks that could easily be incorporated into your wedding. Emerald green rouched sleeve dress by Parker for your bridesmaid dress. Be the envy of all onlookers with this emerald green cocktail ring. Emerald earrings are the perfect gift for bridesmaid or yourself. Nars dual eyeshadow in ecru and emerald shimmer Makeup and Makeup Forever aqua liner in emerald green sheen. Signature monogram wedding invites from Wedding Paper Divas in Green. Emarld green Lizard-embossed Alice + Olivia sandals are a bold accessory and an easy way to add the The Pantone Color Of The Year 2013.